There is so much stuff in the world that there’s no way to notice everything, but sometimes things just reach out and grab you. For example, these two clocks by Adolph Loos (1870 – 1933) at the Neue Galerie in New York. Loos was an architect who also designed furniture and all sorts of objects. 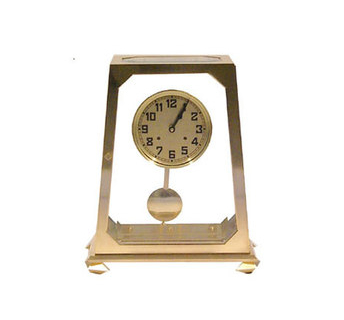 The tall clock is smallish grandfather-size, the other for tabletop or mantel. Both are pendulum models with brass and glass cases, handsome faces, visible works, and lots of space inside. Spacious, gracious, taut.